The indoor gantry crane is the combination result of advanced technology and professional experience of Ellsen Company. 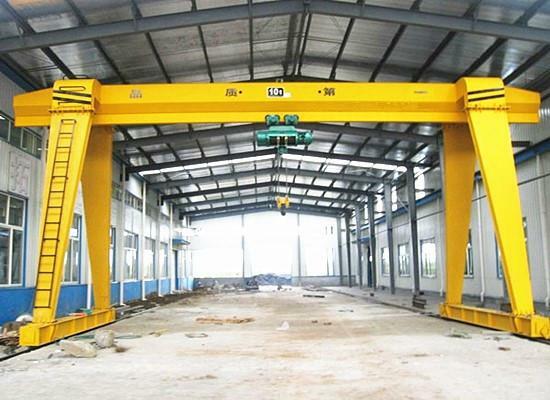 Due to easy installation and maintenance, the indoor gantry crane is widely used in garage, warehouse, workshop and other indoor working sites. We are quite confident to manufacture various kinds of indoor gantry crane, such as the MH type box structure gantry crane without cantilever, MH type box structure gantry crane with cantilever, MH type truss structure gantry crane without cantilever, MH type truss structure gantry crane with cantilever, and the BMH box structure semi gantry crane. Besides, we are also capable to custom different kinds of indoor gantry crane according to your detail demand to meet all your requirements. The unique geographical advantages ensure a fast delivery. Neared to the Beijing-Guangzhou expressway and Zhengzhou international airport, we offer a fast delivery no more than five days. Just as the data in the past six years, there is zero-error in our delivery system. The strict and high standard offers perfect gantry cranes. During more than one century’s growing, our company always insists on the principles of “customer first, quality ahead” to manufacture every material lifting equipment and components on the basis of multi-standard, such as DIN, FEM and ISO. We also provide a series of test before you purchase. The excellent enterprise spirit brings a big development potential. Our company provides a wide-range service associated with design, manufacture, installation and maintenance of the indoor gantry crane. Relied on high-quality and profound service, our gantry crane machine has been the hottest and most popular choice for the home and aboard, acquiring various well know clients. With operation principal of “seeking truth and being pragmatic”, our company wins a vast potential for future development.